Have you ever seen “quick and easy” cooking videos show up in your Facebook feed and thought, “I could totally make these!” only to find yourself halfway through the prepping realizing that it’s anything but easy and a whole lot more work than is shown in the 2 minute clips? But because I have mad kitchen skills (not really), I’m usually able to find a work-around and turn it into something the family will eat and I would totally make again. This is exactly what happened with a video shared by Delish on how to make zucchini chicken enchiladas. I am a big fan of Whole Foods Step 3 naked or salt and pepper rotisserie chickens and like to use them as a shortcut for some of my favorite chicken dishes and figured I would use one the first time I made this dish. I also picked up a jar of their organic red enchilada sauce so there wasn’t much to do other than saute some veggies, slice up the zucchini, and make the roll-ups. Should’ve been easy enough... except that the zucchini slices ended up being too thin. Apparently I did not have the right tool, and there was zero chance they could be rolled into anything. It was also taking forever to get a few usable slices so I just opted to use a knife and try to slice it as thin as possible. I put a layer of the zucchini slices on the bottom of the pan and a layer on top of the chicken mixture and called it dinner. Other than the zucchini fiasco, the dish turned out amazing and I figured it was worth trying again but with different tools. I also wanted to try making it with chicken breasts I cooked myself. The second go-round took waaaaay longer with the addition of having to cook the chicken first but this time, I got the zucchini to cooperate by using a cheese slicer (picture included). I still decided to skip trying to make it fancy by rolling them up and stuck with the layering, which worked well the first time. After trying this dish with both types of chicken, I will only be making this with a rotisserie from now on. The additional cooking time for raw chicken made this a 2 hour ordeal and ain’t nobody got time for that. I also tweaked some of the ingredients and made it more “Heather friendly”- simplified with some extra flavor. This is now a dish that could be saved for nights when you don’t have a ton of time but want to feed a whole crew, keto or otherwise. In this recipe, I’ve included a way to keep even the carb-eaters happy. After you make this, and I highly suggest you do, let me know what you think! Preheat oven to 350º. In a large skillet over medium heat, heat oil. Add onion and season with salt. Cook until soft, 5 minutes, then add garlic, cumin and chili powder and stir until combined. Add shredded chicken and 1 cup enchilada sauce and heat until warmed through. 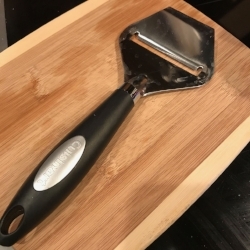 Cheese slicer doubling as a zucchini lasagna slicer. Using a cheese slicer like pictured here, slice the zucchini into thin strips. In a large greased baking dish, lay out zucchini strips and then layer the chicken mixture on top. Add a layer of cheese - 1 cup. Add a top layer of zucchini. Spoon remaining enchilada sauce over zucchini enchiladas and sprinkle with remaining cheese. For those that have family or friends that like the carbs, there is plenty of the chicken filling to do 1 large baking pan with the zucchini and another small baking dish to make 3-4 enchiladas with tortillas.